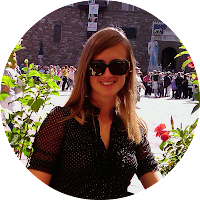 I have been a little slow returning to my blog after the holiday season. January flew by in the blink of an eye and I cannot believe it is already February! With all that being said, it is high time to get back into blogging. First up is a recap of our New Year’s trip to Salzburg. The view of the center of Salzburg and the fortress from the Modern Art Museum. One of my favorite things about living in Europe is the close proximity to other countries. I will never get tired of the fact that within a few hours we can be in a different country with a different language, landscape, and an entirely different cuisine! We hopped in the car before sunrise a couple days before New Year’s Eve and in less than 6 hours we arrived in Salzburg just in time for lunch! I have to say I was surprise by the size of Salzburg. 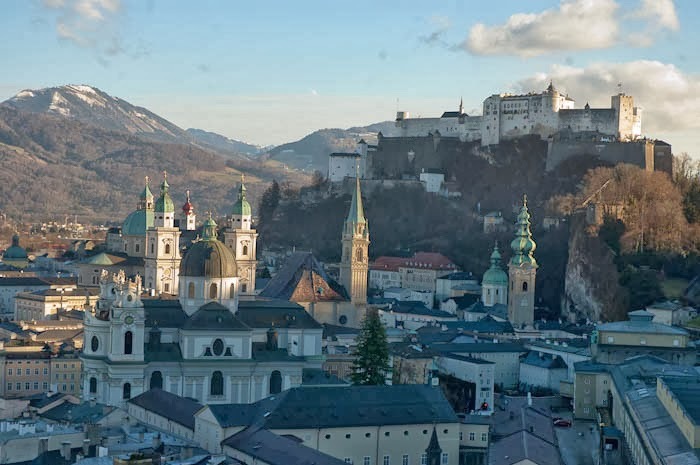 It is quite small seeing as it is the 2nd most well-known city in Austria behind Vienna (the official statistics report that Salzburg is the 4th largest city in Austria). Andrea explained that it is often called the Jewel Box of Europe and I can see why. There are beautiful buildings lining the river on the west side of the city and each building is a different pastel color. Behind those you can see steeples, towers, and roof tops rising above the city center and behind that the giant fortress on the hill. The city is small but full of sites to check out. 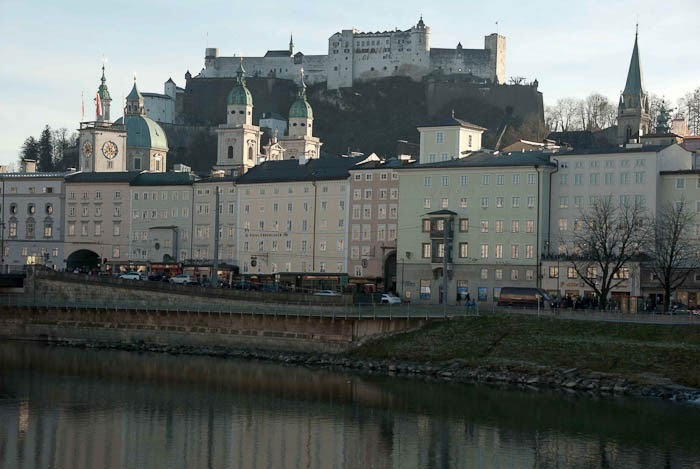 My favorite site in the city center was the Residenz which served as home to the Archbishops of Salzburg. The palace is ornate with humongous paintings adorning almost every wall and ceiling, gold detailing everywhere and no shortage of glittering chandeliers. After working our way all the way through the enormous palace we discovered that if you go through the gift shop and past the snack room then there is a door that leads onto a large rooftop deck that used to connect the palace with the church and from which you have great views. Three different rooms in the Residenz. 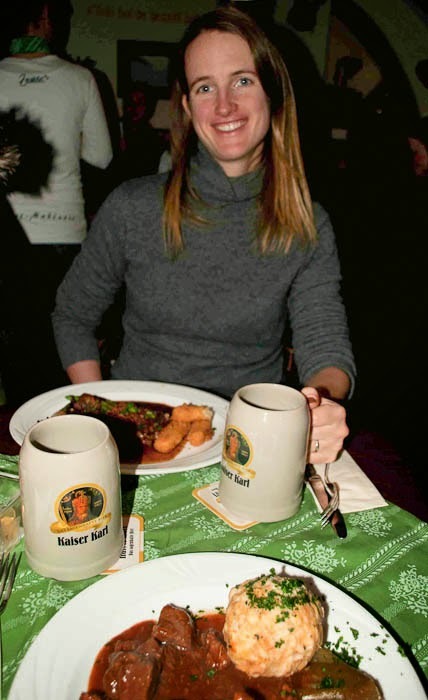 Of course, whenever I travel anywhere my favorite thing to do is experience the local cuisine which in Salzburg meant lots of Goulash (a hearty meaty stew), Wiener Schnitzel (turkey, pork, or veal steak pounded thin and fried) with cranberry sauce, Frankfurters, and lots and lots of beer. The food is definitely hardy in that part of Europe and the portions are generous! Check out my stronghold on that beer! Andrea's huge Canederli (dumpling made with bread or potato and speck) is almost as impressive! This is what our lunch looked like almost every day! 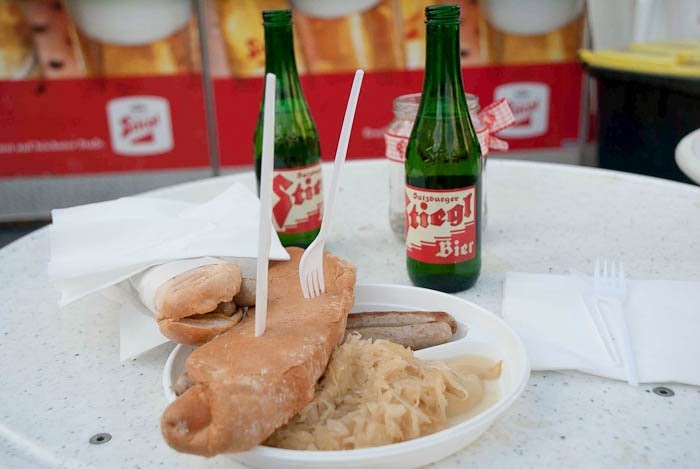 Sausage, kraut, and beer! Yum!! 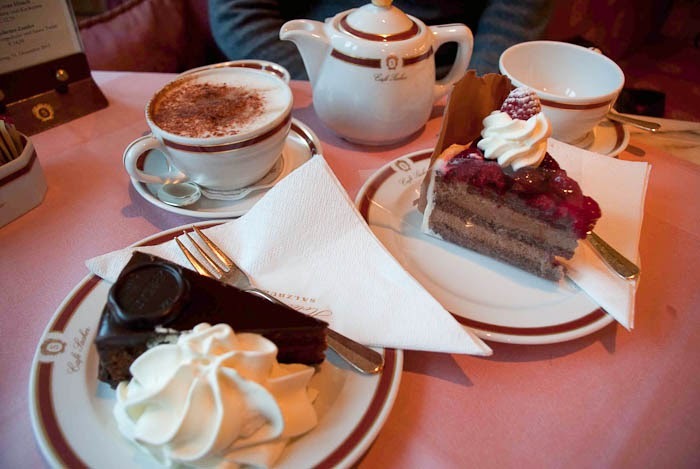 Our afternoon treat at Café Sacher - Sacher torte and chocolate and raspberry cake! My favorite memory of the trip happened by chance on the 31st of December – we had been walking all day and after a short break for a coffee and Sacher Torte (how can you not when you are in Austria?) we decided to walk up to the top of Kapuzinerberg (a hill on the east side of the river) at sunset to see the panorama of the city center. When we got to the top of the hill we noticed there were quite a lot of people that seemed to be standing around and waiting and there were two groups of men in costume. I assumed that maybe at sunset they were going to sing….little did I know! As soon as the sun fell behind the mountains thundering gun shots started ringing out. I looked across the valley to the hills on the other side of the river and saw flashes of light as guns were fired and the rumbling shots rang out. Then all of a sudden the shots were happening next to me! The men in costume were shooting off historical muskets. The groups would shoot them off in succession and then a group on the other side of the river would respond with a round of shots. This went on for over half an hour! It was extremely powerful! I loved everything about this experience - especially that it was a complete fluke that we saw it! Check out those costumes and the muskets. 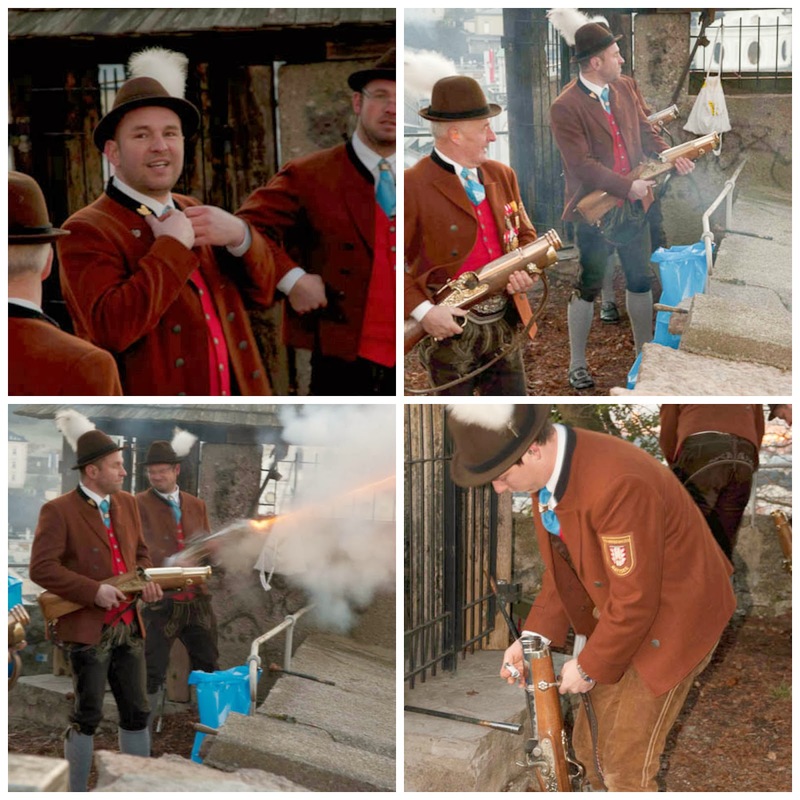 Look at the guys face in the bottom left photo as he fired the musket! For New Year’s Eve we returned to the same spot on the hill above the river to watch the fireworks but some many people were shooting off their own individual fireworks and creating so much smoke that it was impossible to see any of the organized fireworks. We felt satisfied though with the show we had seen earlier that evening and not all that surprised seeing as how we have bad luck with fireworks on New Year’s Eve (someday I’ll put up the story of our first New Year’s Eve in Paris). On New Year’s Day as is tradition in Austria, we went to two concerts. The first in the morning was at the theater and the symphony performed three beautiful pieces. The thing that stood out the most to me, however, was that some of the people attending the concert were dressed in traditional Austrian dress (think of what people wear to Oktoberfest). I have to admit I never knew that people earnestly wore this type of clothing seeing as how I had only seen such clothing at restaurants or in pictures from Oktoberfest where it seemed to be more of a costume. The second concert was in the Residenz. There was a woman who sang opera and a man who played a harpsichord (the same instrument that Mozart played). 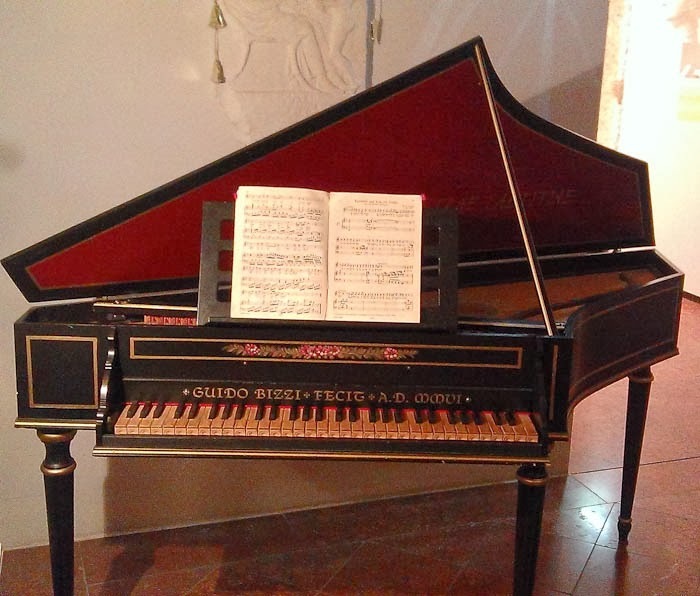 The beautiful harpsichord that the musician played during the concert we attended at the Residenz. There is an abundance of things to see in Salzburg and if you are a nature enthusiastic or the sporty type than there is a whole other set of things to do. You can find my complete travel guide to Salzburg here.